HISTORY: Trumpets originated from end-blown objects such as animal horns, bones, or bamboo. They were primarily used for military signalling. Records indicate that trumpets were used in religious services as early as c. 2000 B.C.E. It is also know that two early trumpets were found in King Tutankhamen's tomb in Egypt (c. 1339 B.C.E.). According to the Bible, Moses made two trumpets of silver. 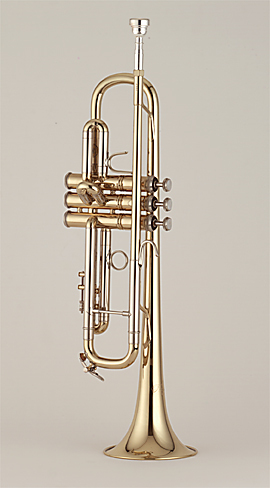 The modern "folded" trumpet (as opposed to a long straight tube) was created around 1400 C.E. Images from the 15th century show performers with both straight and folded trumpets. Trumpets were introduced into the opera in 1607 with opera Orfeo. After that, they became common in opera orchestras and in the 19th century were commonplace in the symphony orchestras. The modern trumpet is a common instrument in concert bands, jazz bands, marching bands, and is used in many genre of popular music as well as in today's symphony orchestra. PHYSICAL DESCRIPTION: A family of brass instruments with a cylindrical bore, valves, and a cup mouthpiece producing a clear, bright tone. Three valves are used to make the instrument fully chromatic. Some models have a fourth valve to adjust for inherent intonation problems of the instrument. A trigger mechanism is sometimes added to the the first or third valve tuning slide that is used to provide a way for the performer to fix the intonation problems with certain valve combinations. SOUND PROPERTIES: Sound is produced (as in most brass instruments) by the vibration of the performers lips. Three valves are used to make the instrument fully chromatic. RANGE: The trumpet is pitchedin the soprano range and has a normal chromatic range from F sharp below middle C to C above the treble clef. Experienced performers are able to extend the upper range, often to the G above the high C (or higher). The trumpet in C is a non-transposing instrument, the trumpet in B flat has the same written range, but sounds a step lower. See also piccolo trumpet; herald trumpet; natural trumpet; slide trumpet. Ludwig van Beethoven: WellingtonÕs Victory, Op. 91, "Drums and Trumpets on the English Side"